Evan Treski is people-smart. He is good at talking with people, even grownups. His younger sister, Jessie, on the other hand, is math-smart—but not especially good at understanding people. She knows that feelings are her weakest subject. 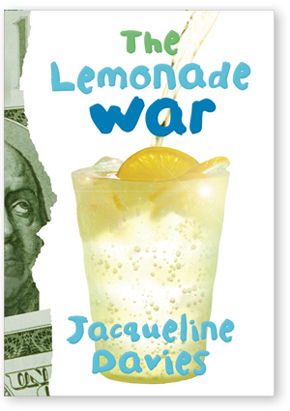 So when their lemonade war begins, there really is no telling who will win—and even more important, if their fight will ever end. Robot's Review: I thought it was really "smart" to include business ideas into the book. Educating kids early on that stuff. Interesting you know. The parts I didn't like: the random religious exclamations. I don't think it needs to be in children's books (or any book for that matter). And especially if it's less than you can count on your fingers, it seems random and unnecessary. As if it's not quite the author's usual vocab, but she put it in there anyway to make her book "cool". Meh. Another part- There's retelling of the bullying that gets to me. It's just sad and really cruel. But the plot was fun. A war between siblings. I enjoyed the different perspectives that were given by the two siblings and how misunderstandings can happen...quite easily. The poor kids! But I can see how this book can open up the possibilities of talking things out and understanding each other's feelings and why each person might be feeling a certain way.